Successfully Added LED Plant Grow Light (Red and Blue High Growth Edition) to your Shopping Cart. LED Plant Grow Light (Red and Blue High Growth Edition): welcome to the revolutionary LED Grow Light, an incredible way to grow plants indoors. For the discerning indoor gardener, this round LED Grow Light produces both red and blue colors in order to promote and maintain maximum plant growth. These are the most important visible light frequencies for your indoor plants for regulating their healthy growth and enhancing the natural process of photosynthesis. By focusing on the red and blue parts of the visible spectrum, the LED Plant Grow Lights are incredibly efficient in optimizing plant health and also save energy by not generating light in colors that plants do not use. 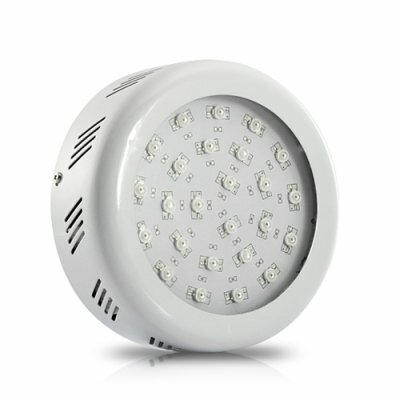 This new High Growth edition is a very special model grow light because of its all metal body design, advanced optical components, and cooling system, which allows for peak performance from the internal LEDs. This design leads to a consistent cone of focused light below the fixture. With a flat base and 3 hook rings, this can be hung wherever you want for maximum benefit and can even be used in an inverted position. You will get a major buzz just from watching your tomatoes and other vegetation grow so strong so quickly! These practical LED Plant Grow Lights would be perfect for indoor gardeners who want to reap the most benefit of maximum plant growth in their own home. This is the ideal Grow Light for plant enthusiasts and plant breeders everywhere, enjoy the fruits of your labor with these incredible Grow Lights! Order yours today as a sample to see how good it really works and then buy in bulk to optimize your cost savings!